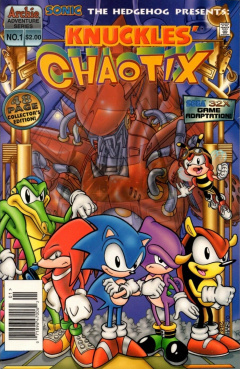 Knuckles' Chaotix is the fourth Sonic Special published by Archie. It includes three stories: "The Chaos Effect", ""Tag! You're It! ", and "The Hunt Is On". 3 The Hunt Is On! The story begins as all the Freedom Fighters, including minor members, have come to a carnival situated on top of the Floating Island. Although the Freedom Fighter are enjoying themselves, Knuckles arrives and tells Soni that he wasn't the one who invited all of them to the Carnival. A rat walks up, bumping Knuckles out of the way, introducing himself as Renfield T. Rodent. He tells the group to enjoy themselves, leading the Freedom Fighters into a Hall of Mirrors for a free ride. Not wanting to give up a free ride, the group unreluctantly enter the hall. They look at themselves through the distorted mirrors. Knuckles suspects there's something wrong. Suddenly, a flash of light appears blinding everybody in the hall. Knuckles closes his eyes in time to prevent being blinded by the light. He opens them up, witnessing all of the Freedom Fighters trapped inside the mirrors themselves, unable to escape. Robotnik appears as a hologram inside of one of the mirrors, telling Knuckles about how he hired Renfield to do the work of getting rid of the Freedom Fighters for him. Knuckles tries to break the glass separating him and the Doctor, but ends up slipping and falling on the floor. Robotnik reveals that the released energies from the light have taken away all of Knuckles powers. He says that although he could have transported him to the other dimension with the others, he needed a witness for his plan. He lets Knuckles leave the hall, all the while laughing at his success. Knuckles heads out, away from the carnival. He sits on a rock and tries to think of a plan to rescue Sonic and the gang. Without his strength, and loss of his sharp knuckles, he's powerless to help. He looks up as he sees something zoom by him at a quick speed. The being stops, introducing himself as Charmy Bee. He asks Charmy why he wasn't at the carnival with the others, to which he replies that he had better things to do. He flies over to a nearby tree, as a voice comes from it. Knuckles watches as a purple chameleon reveals its tree camouflage cloak. Charmy introduces the lizard as Espio. Espio climbs off the tree, when the ground starts rumbling. The trio look over to see the source of the sound, as a crocodile named Vector arrives, rapping to some loud music on his headphones. Espio walks over and yanks the headphones off of Vector, making him realize he's walked in on the group. Suddenly, the ground starts shaking. The wall of the mountain they are beside explodes, as an armadillo, Mighty, pops out. Vector is curious how he got through the mountain so easily, as Mighty reveals that he had some assistance. In the darkness of the hole in the mountain appears a glowing mechanical eye. The being comes out, with a friend, named Heavy and Bomb. Knuckles takes up a fighting stance, but Mighty reveals them as friends. Heavy explains their history to Knuckles, initially programmed to seek out and repair damaged systems by Robotnik. Robotnik, however, had programmed them too well, allowing them to develop a consciousness...and self-thought. Having heard about Robotnik's plans to capture the Freedom Fighters in the fun house, they decided to break from Robotnik and escape Robotropolis. Knuckles, however, is still sceptical about their true nature, so Heavy asks for the group to follow him so he can prove his loyalty. They walk into the cave in the mountain and arrive at a large cavern with a silver chest in the middle. They walk over as Heavy opens it, revealing a ton of power gems, similar to ones used to give Heavy and Bomb consciousness. Knuckles takes one of the gems out, realizing that the group can give Robotnik a lot of trouble with them. In his lair on the Floating Island, Robotnik gloats at his victory with Renfield at his side. In the middle of gloating, the building shakes and alarms go off. He looks at his displays, which show all the rides in the carnival being reactivated. As it wasn't his idea, he suspects Knuckles to be the culprit. As each ride is activated by a separate switch, he also suspects that he has received help. He never suspected this, but he has a contingency plan. He activates a teleporter connected to Robotropolis, transporting in some help: Mecha Sonic. Robotnik orders the rebuilt robot to head out and destroy the new Freedom Fighters that have popped up. With new upgrades, Mecha Sonic flies out of the lair. While Knuckles and the others wander around the carnival, they watch as Mecha Sonic flies in. They decide to take the new enemy out together. Charmy flies in first and hits the robot on the head, with no effect. To get Mecha Sonic's attention away from Charmy's failed attempt, Espio calls out to it from a rooftop in the carnival. The robot flies down at Espio, but he is able to jump away in time and camouflages into hiding, causing Mecha Sonic to crash into the building. It gets up and looks over, seeing Knuckles and Vector preparing to attack using linked rings. Vector holds back as Knuckles lunges at Mecha Sonic. The robot steps aside and grabs the link between the rings, sending the two Chaotix members flying around. Vector, however, is able to take control and sends Mecha Sonic flying away instead, right toward Mighty. He winds up and gives Mecha Sonic a huge punch, sending him through two tents and landing beside Bomb. Bomb walks beside the dazed robot, setting off its counter: exploding right beside it. The group thinks Mecha Sonic is destroyed, and Knuckles thinks that Bomb has been destroyed as well. Luckily, Bomb is able to repair itself even after such an explosion. Their problems aren't over yet, as Mecha Sonic grows into a large red version of itself: Mecha Sonic Kai. To take care of this new threat, Heavy tosses a power gem to Knuckles, which causes him to grow as well. Now super-sized, Knuckles stands a chance with this new Mecha Sonic form. Even with his power stolen earlier, the power gem gives him an edge and he gives Mecha Sonic a huge punch. Robotnik watches all of this go down, as Knuckles leads Mecha Sonic back near the hall of mirrors. Robotnik can only watch as Knuckles punches Mecha Sonic again, causing him to fall onto the hall of mirrors. The destruction of the hall destroys the mirrors, freeing the Freedom Fighters from their prison. Not only that, but Knuckles and Mecha Sonic both shrink down to normal size, and Knuckles receives his strength back. Mecha Sonic can do nothing but watch as Knuckles uses his returned strength to give it a huge blow, smashing it into pieces. With their plan foiled, Robotnik and Renfield go to a rocket to escape the island, while the Freedom Fighters chase after them for revenge. Robotnik hops on the rocket and kicks Renfield aside, escaping the island without him. All Renfield can try to do is escape on foot, outside the carnival. Before he can reach the carnival gate, he's caught by the Chaotix and thrown in a trap. As Renfield is escorted by police, Sonic commends Knuckles for his work, and that he has found his very own team. The other members of the Chaotix, however, are not as amused at the prospect of working with each other. Despite their misgivings, Sonic feels they'll be teaming up again in the future. Mighty is standing around in a forest on the Floating Island, when Charmy flies by by surprise, tagging Mighty. He flies away, but Mighty doesn't want to play any games. Asking him if he has anything better to do, Mighty realizes he doesn't, and decides to chase after Charmy. With Mighty in the game, Charmy decides to see if he can get the other Chaotix in his game. He flies by Vector, warning him to watch out for Mighty. Despite his warning, Mighty runs up behind Vector, knocking him down and tagging him. Charmy flies around Vector, trying to antagonize him, but Vector can't tag him due to his rapid flying skills. Then Mighty walks over, mocking Vector, but avoids his reach. He runs over to a tree and, using his strength, knocks it down near Vector. It narrowly misses as the crocodile moves aside and falls down. He hits an invisible object and is pushed aside, as Espio reveals himself, awoken from a nap. Vector asks how he was supposed to know he was there, then taps his shoulder, telling him he's it. Vector runs away as Espio gets himself together. He goes to chase after him, but trips and falls on the other side of a bush. He looks up to see a mysterious bug that disappears as quickly as it appears. Charmy comes over to aid Espio after his fall. Espio isn't sure what he saw, but quickly touches Charmy, starting the game's cycle all over again. Vector, Mighty and Charmy are hanging out together on the Floating Island. Knuckles runs over, but instead of pleasantries, quickly tells the group to get down. They follow his orders, as two explosions go off over their heads. They get up with no injuries, suspecting that Robotnik may be up to his tricks again. Knuckles, on the other hand, thinks it could be the new-comer to the island: Archimedes, as he is unsure if he is friend or foe. Meanwhile, Vector takes a few steps around and gets caught in a ground trap, getting sucked into the ground. He falls into a pit and lands on a rocky bottom. Charmy flies down to check on him, and all is well. Charmy isn't strong enough, so Knuckles thinks the only way they can get him out with rope. Before they can do so, Mighty hears a whistling noise. Charmy comes up from the hole and can hear it as well. They look as a number of blue spherical objects come up from over the horizon, toward the three. They run away and duck, as the balls fly over them and crash into a cliffside, exploding on impact. Charmy, however, got caught off guard and lands in a bush, disoriented and injured. Although they are able to find Charmy, Knuckles is also concerned about Espio, as he saw him earlier. The chameleon decloaks on a tree trunk, with his stealth discovered. The three of them walk over to Charmy to check on his condition. Charmy has been disoriented from the explosion, so Mighty thinks that he only needs some rest to shake it off. Knuckles reluctantly agrees, as they have a bigger problem on their hands. Espio asks Knuckles what's going on, to which he thinks that Robotnik may be involved, but due to the recent events on the island, that somebody else may be involved. They look over as they hear some whirring from a nearby bush, as a treaded robot pops out and heads for Mighty. The two start to fight, but due to the equal strength, remain at a stalemate. Espio asks Knuckles if they should intervene, but the Echidna thinks Mighty will be fine, and that they should find out what's going on. As they leave, the fight ends, leaving both Mighty and the robot tired. As Espio and Knuckles continue on, a cloaked figure walks up behind Espio, muzzling him and pulling him away. Knuckles asks Espio to be quiet, looking back and sees him missing. Now alone, he wonders what he should do next. Suddenly, Knuckles hears a voice from afar, telling him he still doesn't think, and that he would've went through these events easier if he remained with his friends. Unfortunately, Knuckles thought the objective, the source of the attacks, was too important. The mysterious voice tells him that he knows what's going on, and that he must choose what is more important: his friends, or the threat to the Floating Island. This special issue is based on events from Knuckles' Chaotix, released about 10 months prior to the comic. Metal Sonic, named Mecha Sonic in the comic, is reintroduced after being destroyed in issue 25. This issue also introduces the Metal Sonic transformation Metal Sonic Kai. The ending of the comic mentions about the story continuation, but mistakenly says issue 3 instead of issue 31.